Paul Carr in yellow Munster top and Kieran 'Rashers' Ryan in white hoodie on Carr's right after he won a poker comeption. A professional poker player who is closely aligned to feuding criminals has lost almost €279,000, which was the proceeds of crime. Paul Carr (34) won €312,600 and was feted on 'The Late Late Show' when he came second at the No Limit Texas hold'em Paddy Power Irish Open tournament in 2010. However, over the past 10 days, the State has successfully claimed before two court sittings that separate cash seizures made in Limerick – €242,230 and €36,000, which Carr claimed to have won through gambling – derived from crime. During his 2010 poker success, Carr, who has 23 previous convictions, managed to beat off competition from retired soccer stars Teddy Sheringham and Tony Cascarino along with former Leinster rugby player Reggie Corrigan and snooker legend Ken Doherty to claim more than €300,000. 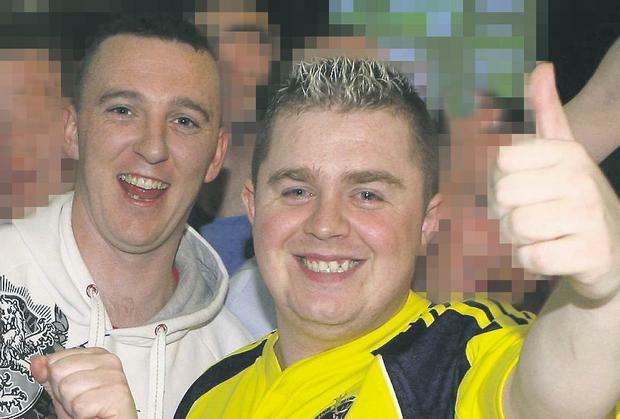 Carr, with a previous address at Varty Avenue, Raheen, Limerick, openly celebrated the success with friends, including well known Limerick criminal Kieran 'Rashers' Ryan who is involved in the city's gangland feud. The poker player also appeared on 'The Late Late Show' days after the poker tournament, where he was interviewed by Ryan Tubridy. However, things turned sour for Carr. On August 29, 2011, officers from Limerick divisional drugs unit stopped a car on the outskirts of the city and found a Dunnes Stores bag packed with cash. A total of €242,230 was seized and the driver arrested on suspicion of money laundering. While the driver was being questioned at Henry Street garda station, Carr and a brother of the motorist presented themselves at the front desk and claimed that the cash belonged to them. A witness statement provided claimed that Carr had won the cash through gambling. Carr said he won over €400,000 through poker and betting on horse racing and soccer games. In the same year, gardai found €36,000 in a bedroom wardrobe in a house on the Old Cratloe Road, Limerick, during a drugs search. Carr also presented himself to officers after this was seized claiming the money was his and he had given it to a friend to mind as he had no bank account. However, the €300,000-plus that he won in the 2010 poker competition was lodged into a bank account in his name. Last September, the State successfully applied before Limerick Circuit Criminal Court that the €36,000 was the proceeds of crime. Carr appealed the outcome to the High Court but on May 30 last, the High Court ruled in favour of the State in respect of the €36,000. A further blow came last Friday at Limerick Circuit Criminal when Judge Carroll Moran agreed that the €242,230 seized was the proceeds of crime. The State has been allowed to retain the cash. In January 2013, Carr was fined €2,500 and banned from driving for four years after he drove through Limerick city in 2008 having taken cocaine. A month after Carr's poker success in 2010, his close associate, Kieran 'Rashers' Ryan was caught with a Browning semi-automatic pistol and 15 rounds of 9mm ammunition at Carrigmartin, Ballyneety, Co Limerick, and was subsequently jailed for eight years.